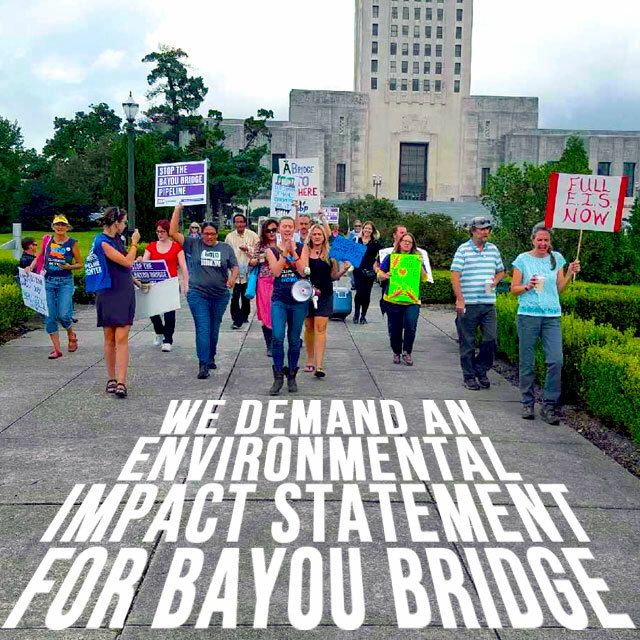 Those present at today’s event, led by the 5th District HELP Association for St. James, BOLD Louisiana, 350 New Orleans, the Louisiana Bucket Brigade and the Gulf Restoration Network are calling for an Environmental Impact Statement (EIS) of the proposed Bayou Bridge Pipeline because of the risks posed by the pipeline, a 162 mile behemoth that would run along southern Louisiana from Lake Charles, through the Atchafalaya Basin and into St. James Parish. The parent company, Energy Transfer Partners and its Sunoco subsidiaries, have polluted the drinking water in Texas, the East Coast and have suffocated wetlands in Ohio. The pipeline’s proposed route in Louisiana would send it across Bayou LaFourche, the drinking water source for 300,000 people, including the Houma Nation. The Secretary of the Louisiana DEQ Chuck Brown, appointed by John Bel Edwards, has been a vocal ally of polluters throughout the state, attacking St. John residents who stood up for clean air at a parish elementary school by calling them “fear mongers.” In the case of Bayou Bridge, the Secretary has actively worked against an Environmental Impact Statement by stonewalling a request for an EIS by Congressman Cedric Richmond. Those at the rally today detailed the ravages that South Louisiana already suffers from the oil industry. The Atchafalaya Basin’s water flow is choked by pipelines. Entire sections of the swamp are dead and dying. Crawfishers’ livelihoods are at risk. St. James Parish residents have not received any answers regarding the spill of 12,000 gallons of crude oil during an accident in March at the Plains All American Pipeline Company. “I am frightened that we are losing our state, our culture, and we will, in the near future, lose our people as the quality of our natural resources are decimated by the petroleum industry,” said Louisiana native Sue Prevost who attended today’s rally. “I want our children to have what we had, what my grandparents had– the peace of mind that we can eat and drink from our waters and soil. An Environmental Impact Statement from the Governor is vital in determining the degree of quality we will continue to maintain– for the sake of our food and the livelihoods of our crawfishers and fishermen. 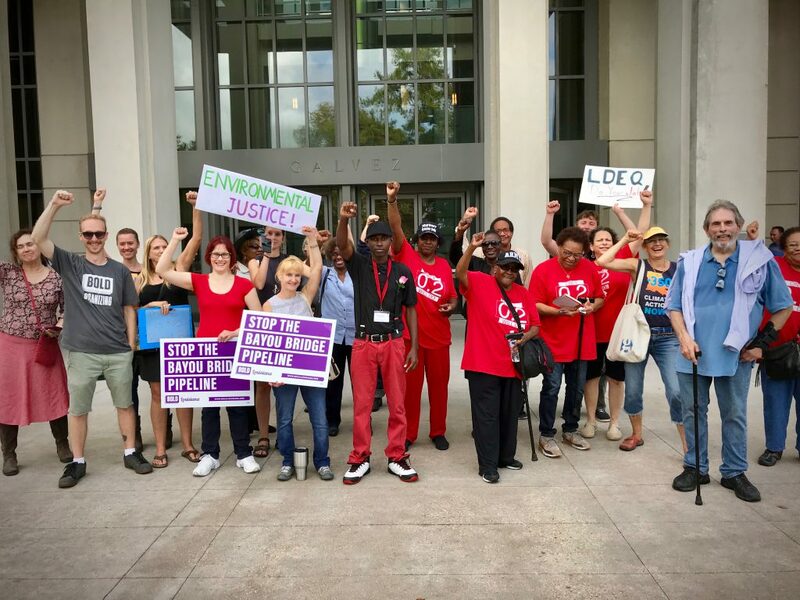 Representatives of the Bayou Bridge Pipeline have changed their public statements regarding where the oil will go, at times stating it is for export, at other times claiming it is bound for Louisiana refineries. The project would only create 12 permanent jobs, with no agreements to hire locally. Like most petroleum industry construction jobs, there is no evidence that this pipeline will benefit Louisiana workers at all. © 2019 #StopETP All Rights Reserved.